The fresh tastes of summer are upon us. 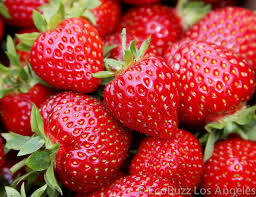 There was a special item in the available options for this week’s share- stunning, ruby-red strawberries! So far, this spring has not been very conducive to growing strawberries. Water is important to get the berries nice and big and plump, but too much rain and overcast weather waters down the fruit’s flavor and creates conditions for disease and fungal issues. We had a few weeks of very wet weather earlier this spring, and then a frost on June 7 when they were in full flower!. But recently, the rain has been interrupted by pristine blue skies and the berries have had a chance to bask in the sun and let their sugars develop. We have even been able to sneak into the patch and harvest the first few to ripen, and we can attest that the flavor is all there! The bags looked pretty full as folks left and we daresay they looked pretty happy too! Not the bags! The folks!